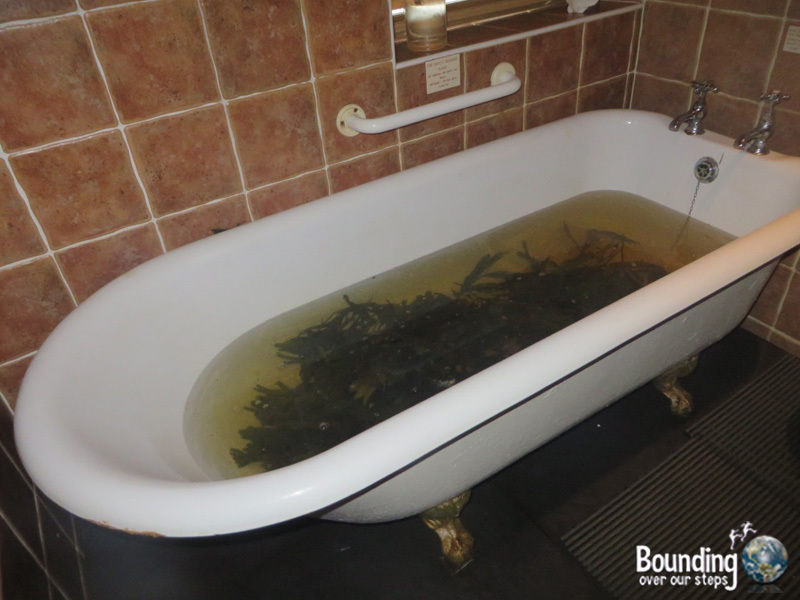 Right at the seaside on Shore Road, Voya Seaweed Baths offers a variety of spa treatments, most of which make use of seaweed harvested off the coast just north of Strandhill in County Sligo. I felt the most compelling on their spa menu was the steam and seaweed bath, which begins with a hot steam to open your pores, before climbing into a deep soaker tub filled with seaweed and piping hot water. The seaweed was slimy and it smelled like the ocean and all I could think of is how much Mindy would have hated both the feel and the smell of it. But I found it so soft on my skin and I felt like a mermaid. I was encouraged to drink lots of water before, during and after the bath because although the minerals in the seaweed were great for the skin, the salt has the potential to dehydrate. To ensure an entirely vegan experience, be sure to let your body worker know of your wishes. They are very flexible and are happy to adjust. All of their products in the baths, treatments and the shop are vegan except for the following: lip balm, Totally Balmy cleansing balm, all the candles and Time to Shine body buff. I had read somewhere online that a colony of seals could be spotted off the coast of Strandhill but no one I asked seemed to know anything about them. 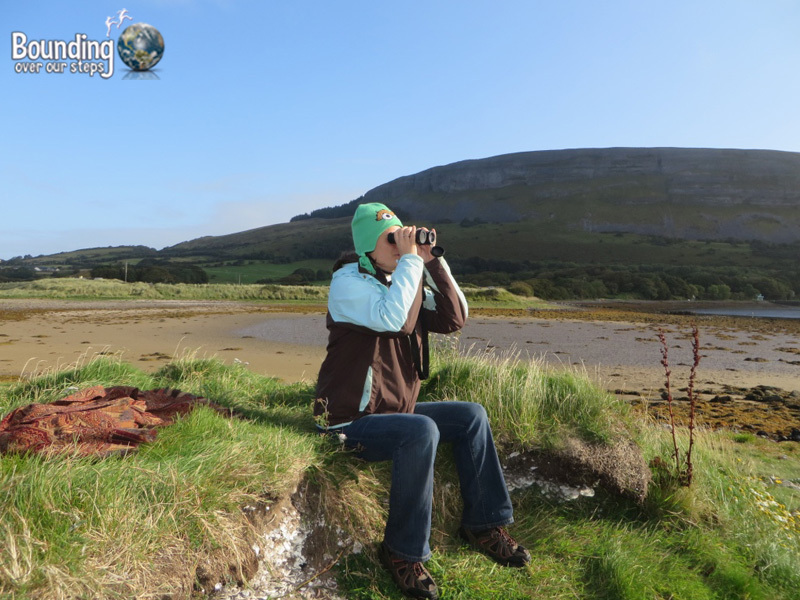 I was determined, however, and after days of searching, I finally found them on Culleenamore Beach, a short walk from the apartment I had rented. The first time I went there it was high tide, which I discovered was the worst possible time to see seals, but the scenery was so beautiful that it was difficult to feel disappointed. 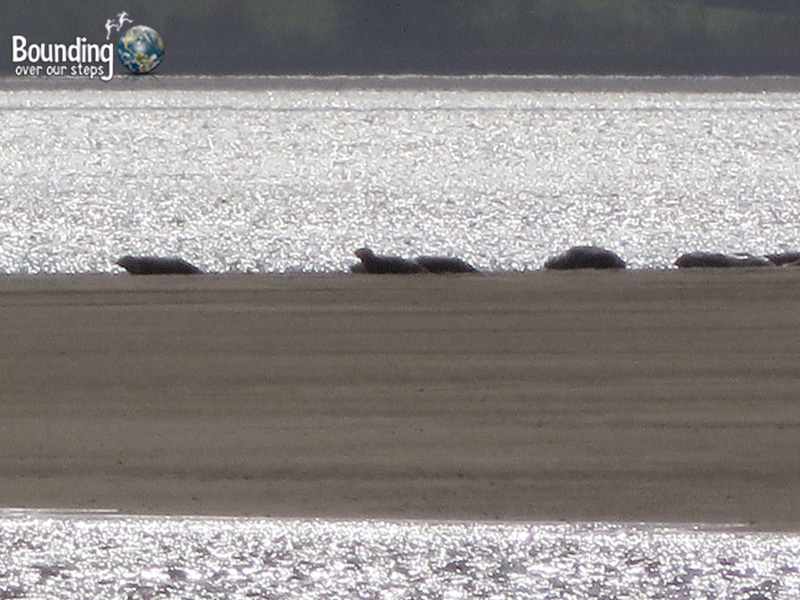 I set out the next day at low tide, which exposes a couple of sandbars on which the seals like to relax. With binoculars in hand I was able to spot SO many seals. On my last morning, I went to see them again and to my surprise a seal swam by only feet from the shore. What a treat! 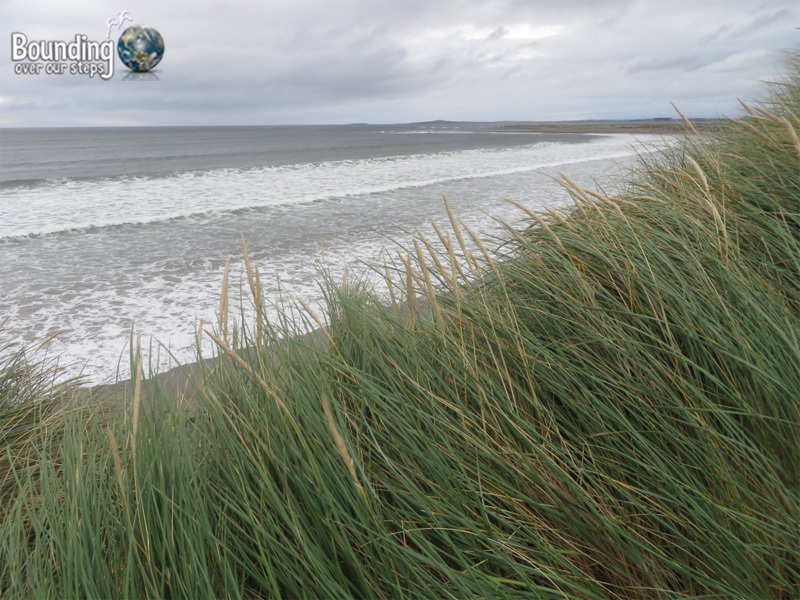 From the bottom of Shore Road in Strandhill with the ocean facing your back, walk or drive up the hill (the name of the street will change to Buenos Ayres Drive, just after Golf Course Road). Make a right on Route 292, which you will remain on until you reach a sign that says nothing more than L35035 where you will make a right. The road passes by some beautiful houses and curves to the right and then to the left. At the end of the road is a small parking lot. Once on the beach walk to the left until you get to a small grass and seashell mound on a small penninsula jutted off the main beach. This is where I sat many times to watch the seals. It is quite comfortable and would be a great place to have a romantic picnic. 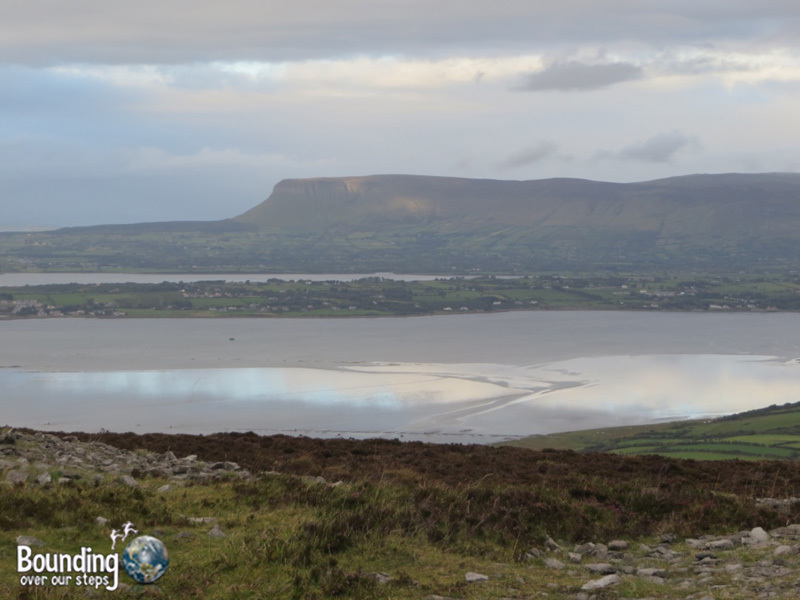 Knocknarea is an unmistakable natural structure that juts out of the already beautiful scenery. 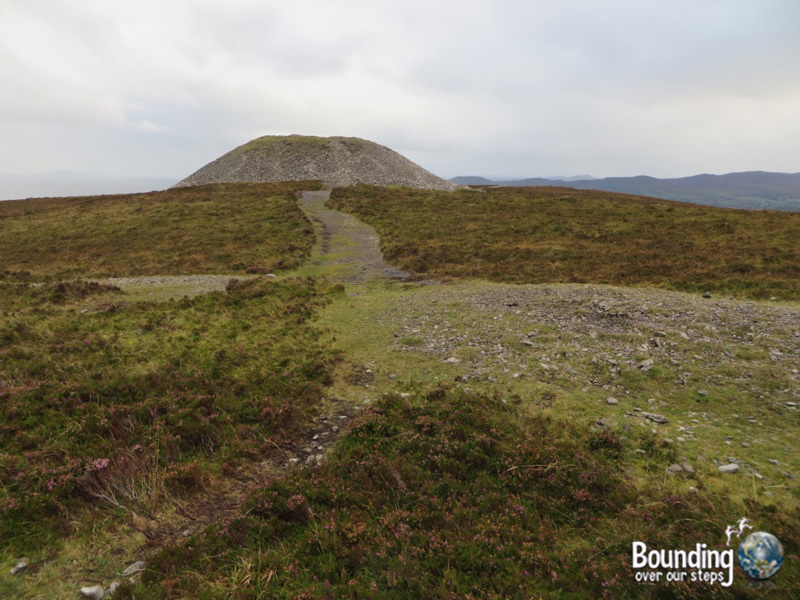 The top of Knocknarea is a plain that offers gorgeous panoramic views of Sligo and is also home to the largest cairn of rocks I have ever seen. 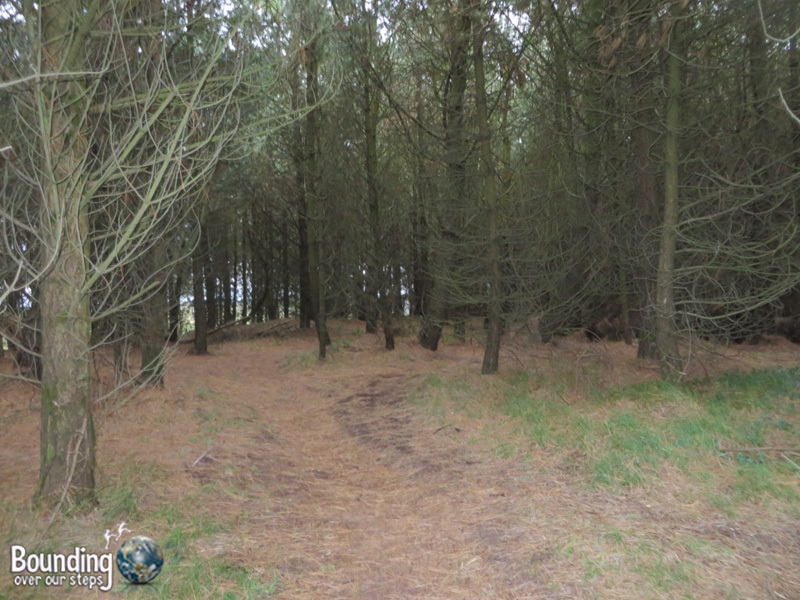 Although it has never been excavated, and those who have tried have died shortly thereafter, locals and scholars alike believe that this is a Neolithic passage tomb that holds the remains of Queen Maeve, who was queen of Connacht about 5000 years ago. Irish mythology suggests that she is bured inside standing up holding her sword and shield like a warrior, a powerful image that resonates with the Irish. 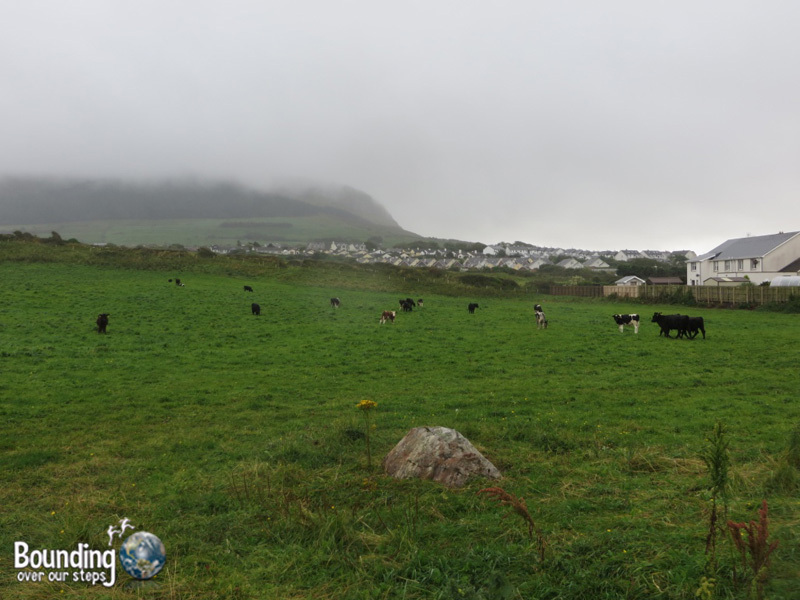 I began the climb at the car park one evening and enjoyed passing (and saying hello to) several cows and as I climbed higher the cows were replaced by sheep and there were many of them. The path became steeper at the top and before I knew it I was there, standing on top of Knocknarea and looking out over the entire area I had been exploring all week. I could see islands and inlets – it was like look at a giant map. Maeve’s grave was nothing more than a large pile of rocks…that is until my Irish friend took out her Irish flute and played an Irish song, the sound travelling with the same wind that struck my face. I felt transported in time and the importance of my location came to life. I could imagine people bringing these limestones up the hill, each one holding significance. Each of those people must have taken a moment to enjoy the same panorama I was enjoying. Queen Maeve must have been a very special person indeed! 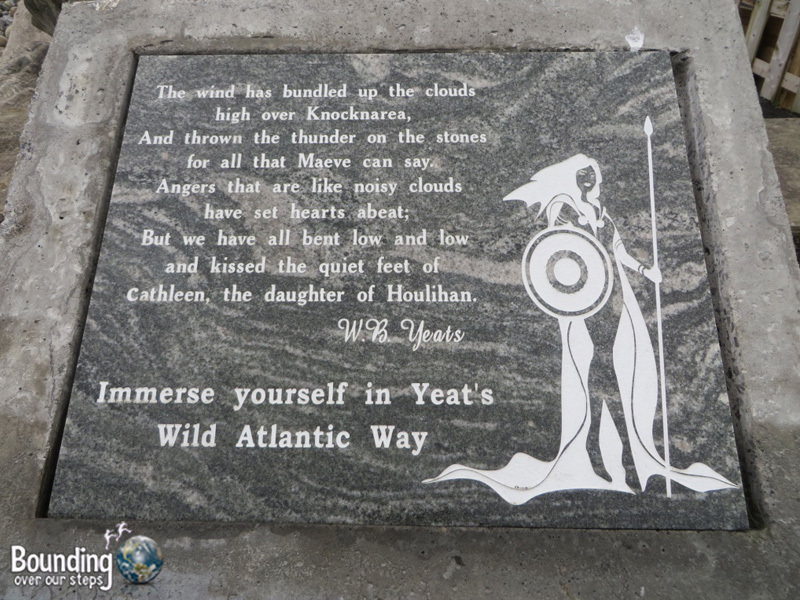 Never did I think coming to Ireland that I would feel somehow connected with people 5000 years before me. 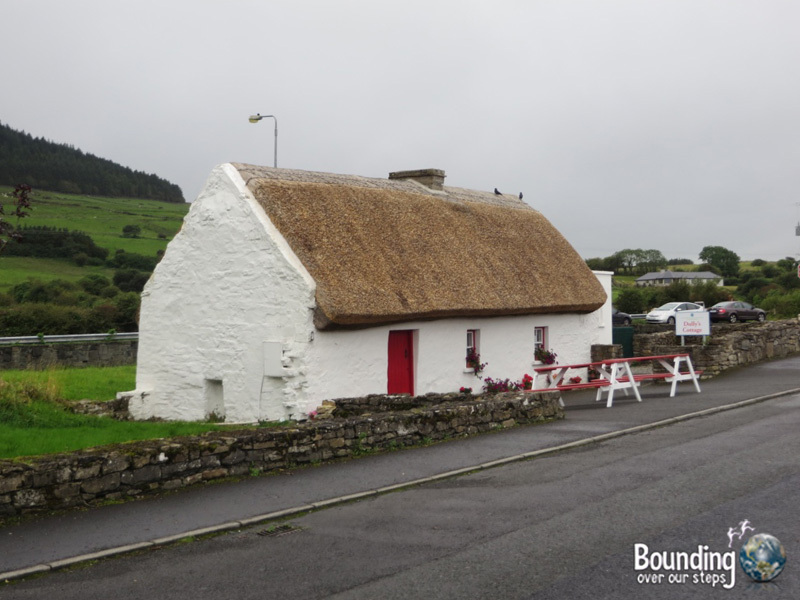 There are two ways to hike Knocknarea: from the parking lot, which is the way I went and is a more direct route to Maeve’s tomb, or the new way as of April 2015 that takes about 15 minutes longer. To reach the old trail, begin on Shore Road and with the ocean behind you, drive up the hill to the main road and make a right. Approximately 2 kilometers out of the village look for signs to your left that will lead you up a road to the parking lot. The new route starts across the street from the Sligo Rugby Club, where you can park and use the bathroom before starting your climb. 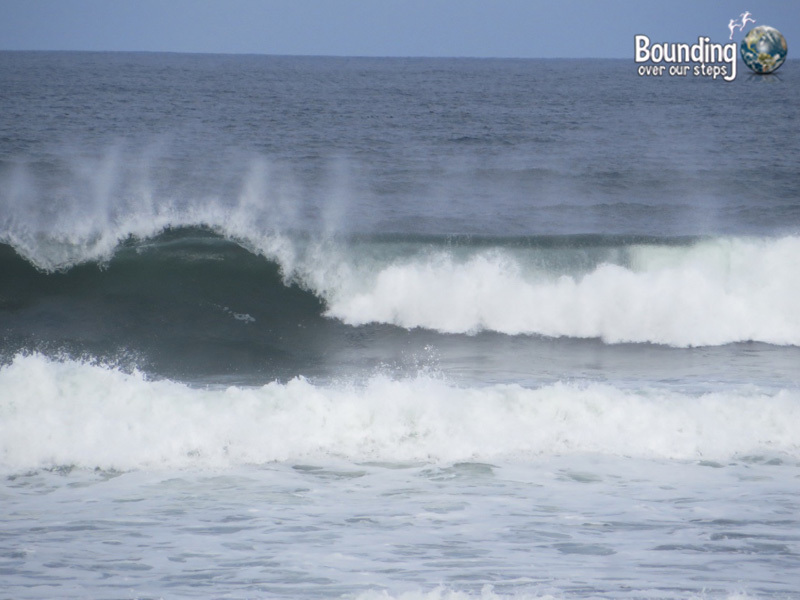 Little did I know that the village of Strandhill would boast one of the biggest surfs I’ve ever encountered. Apparently, it is even worthy of professional surfers, who frequent the area. 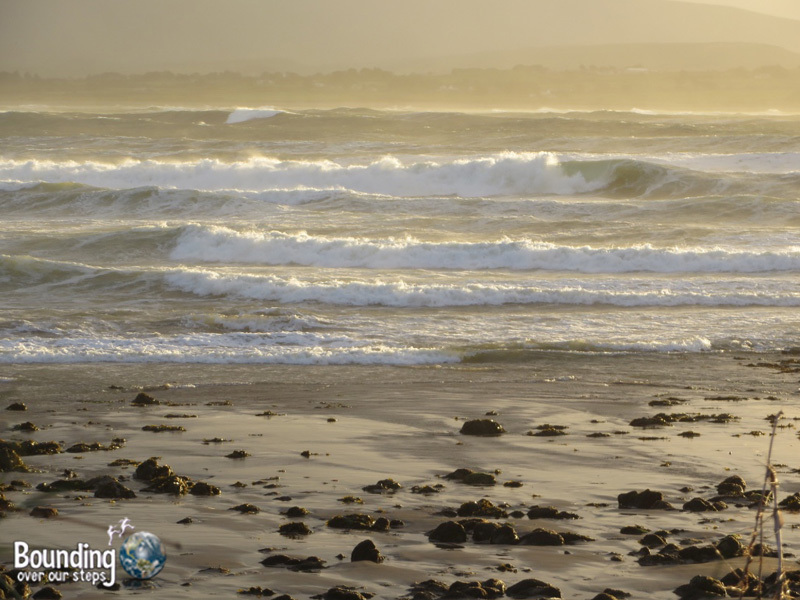 If you’ve ever considered taking a surf lesson, Strandhill would be a place to try it. There are two surf schools there: Strandhill Surf School and Perfect Day Surf & SUP School. And if you are looking for more than just a class or two, consider joining one of the Vegan Surfers’s vegan surf retreats. If surfing is not your thing, there are great places to sit along the shore and watch the surfers. I enjoyed this several times. 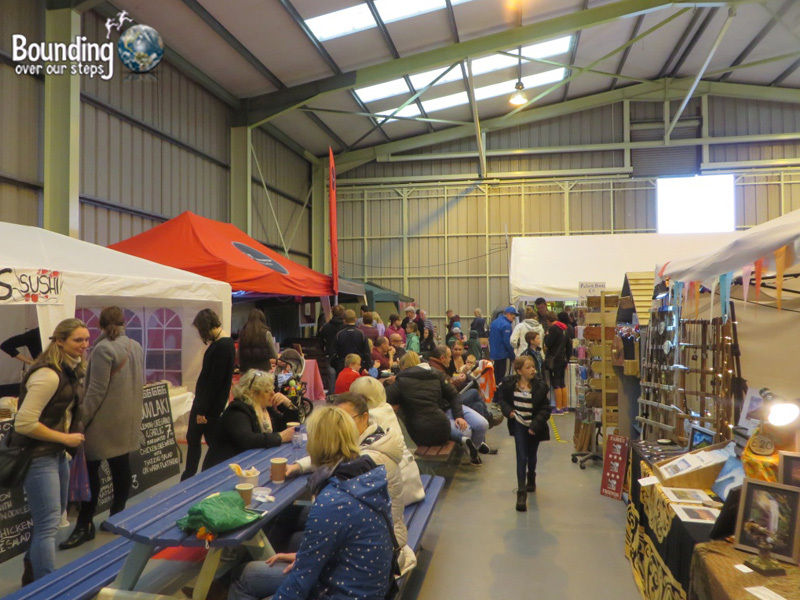 The People’s Market is a local market that occurs every Sunday from 11am to 4pm in Hangar 1 at the Sligo Airport. If you are looking for hand made souvenirs or gifts, the People’s Market is a good place to have a look around. 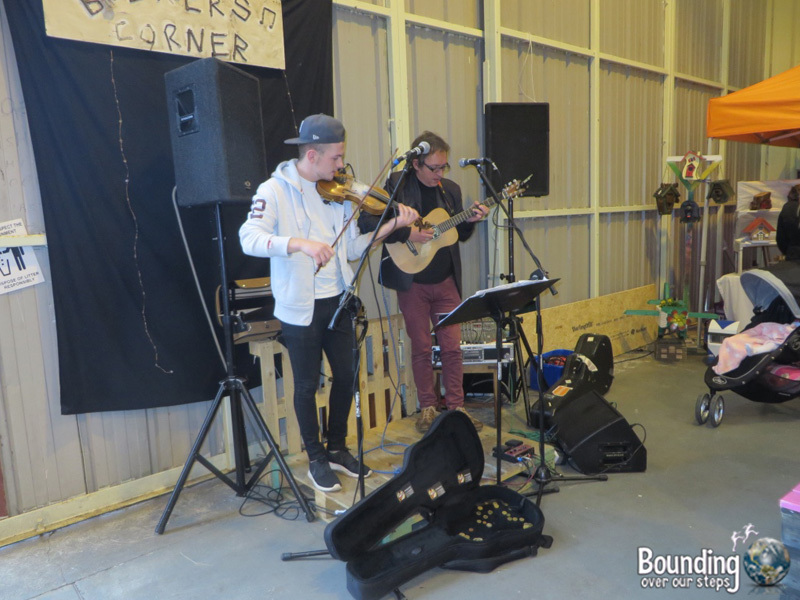 Plus, there is a musicians corner where live music is performed and there are many food stalls, at which a few even had a couple vegan options. What made the long walk in the rain down Airport Road completely worth it, however, was running into The Vegan Surfer, whom I had been following on Facebook for over a year. We had a great conversation and he even gave me one of his delicious desserts to try. 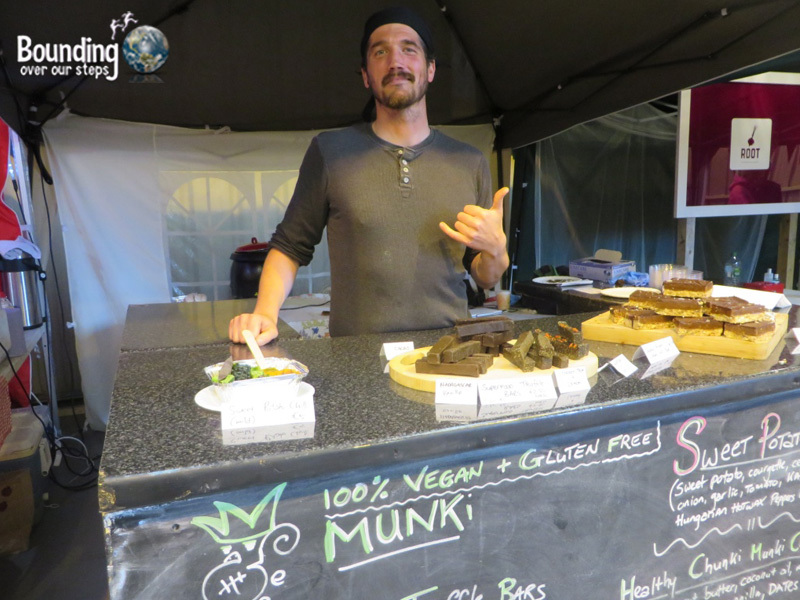 The Vegan Surfer, and his delicious vegan food, can be found at the People’s Market any Sunday that he is not leading a vegan surf retreat so be sure to check his schedule on Facebook. Another surprise encounter that made this journey to the airport memorable was meeting some of the local residents along Airport Road. Seeing lots of cows way out in the field, I walked over to the fence to watch them. 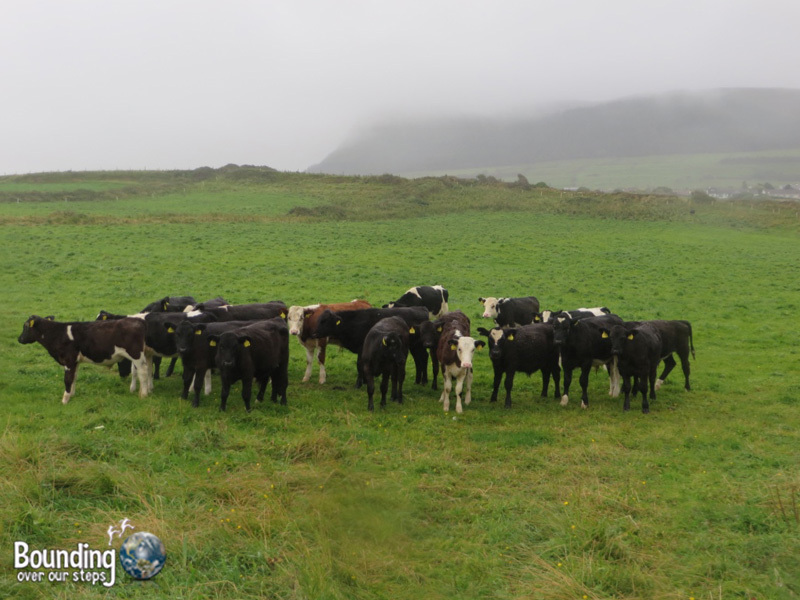 I was spotted immeditely and there was some discussion that more cows joined before the decision was made to come over and check me out. Slowly but surely a group of pioneers inched their way closer and closer to me and as they did more cows joined the journey. Before I knew it, there were many cows within a few feet of the fence, each daring the next to come and sniff me. Finally, one cow was selected to do so and was nudged forward by the group. What an amazing experience! 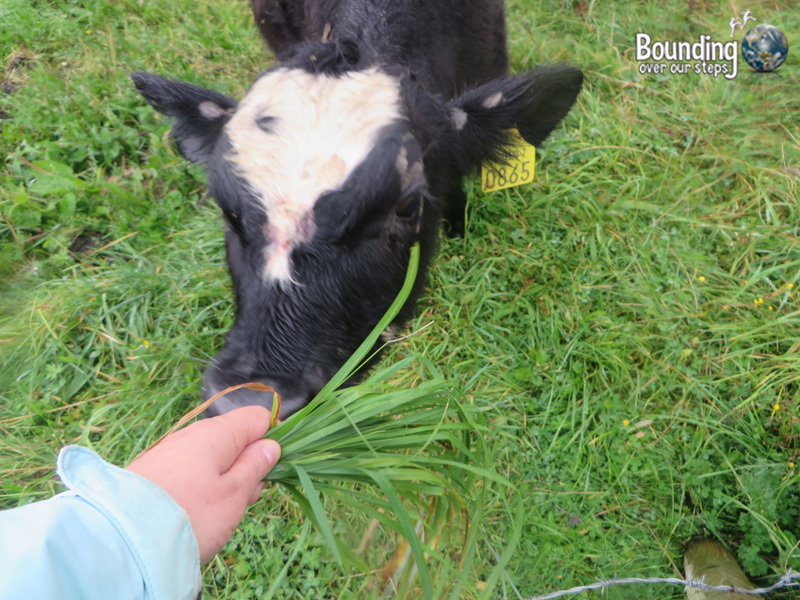 One brave cow came over to me and touched her nose to my hand. She didn’t take the grass. From Shore Road, walk away from the ocean until you reach Airport Road, where you will make a left and simply walk all the way to the airport. Hangar 1 will be on your right. 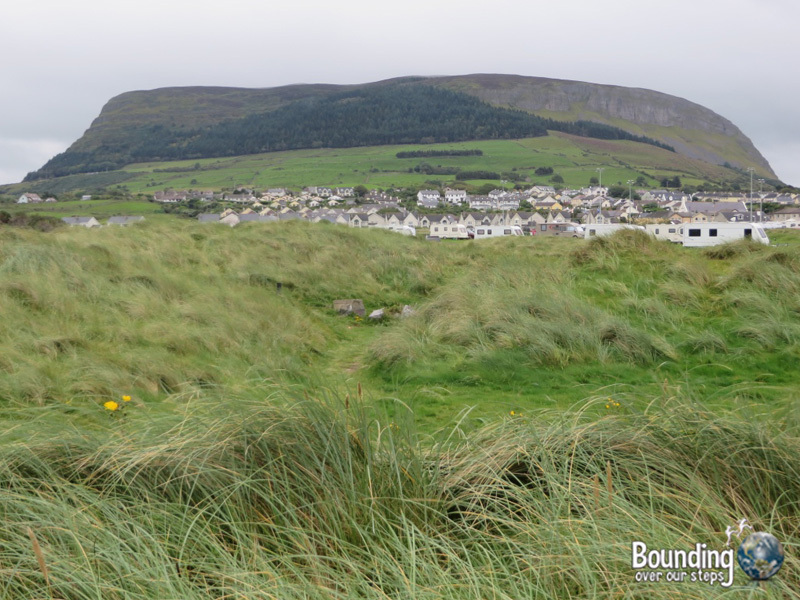 The Killaspugbrone Loop, one of the most varied hikes I’ve ever taken, begins at the bottom of Shore Road in Strandhill and moves towards the right, along the Wild Atlantic Way. 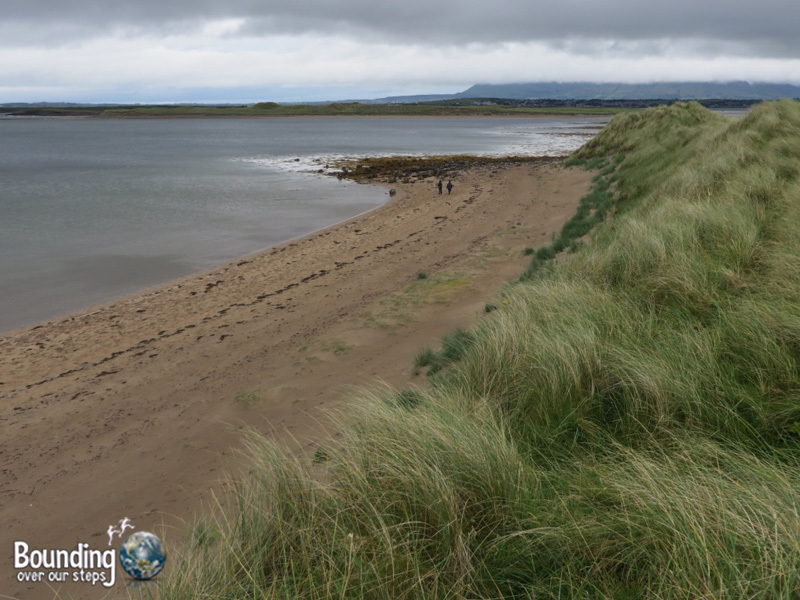 As I started the hike I loved walking on top of the grassy-covered sand dunes following the shoreline to my left. I loved to hear the sound of the waves crashing and feeling the strong wind whipping around me. In the distance I could see Benbulben, another very distinctive mountain formation from ages ago. 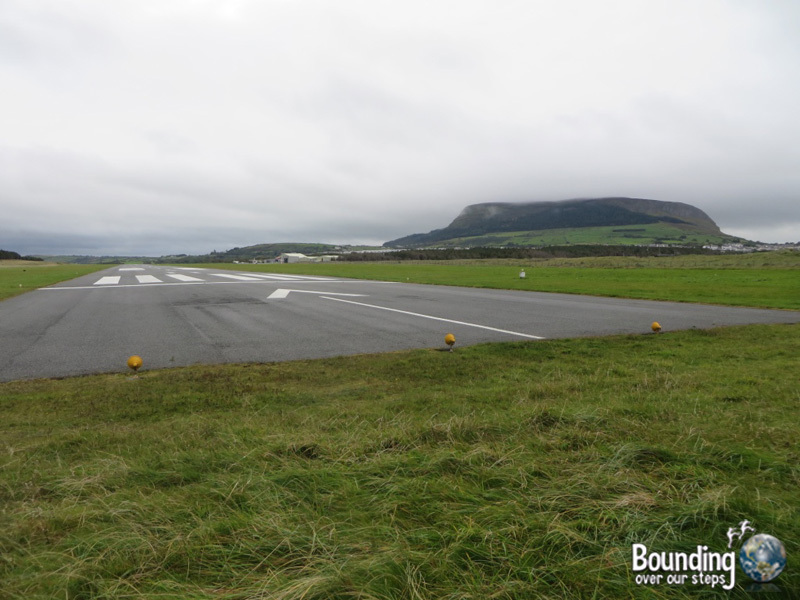 Eventually the path led to the Sligo Airport runway and initially I thought this was the end of the hike. But then I saw a small sign saying that it was ok to cross the runway when the lights weren’t on. I also saw a local woman approaching from the other side. When in Rome….so, for the first time in my life, I walked across a runway, even stopping in the middle to chat with the local woman, who told me what to expect for the duration of the hike. After walking only a short distance through tall grasses, I came to an old church and adjoining cemetery, a signifant location that dated back to the 5th century. 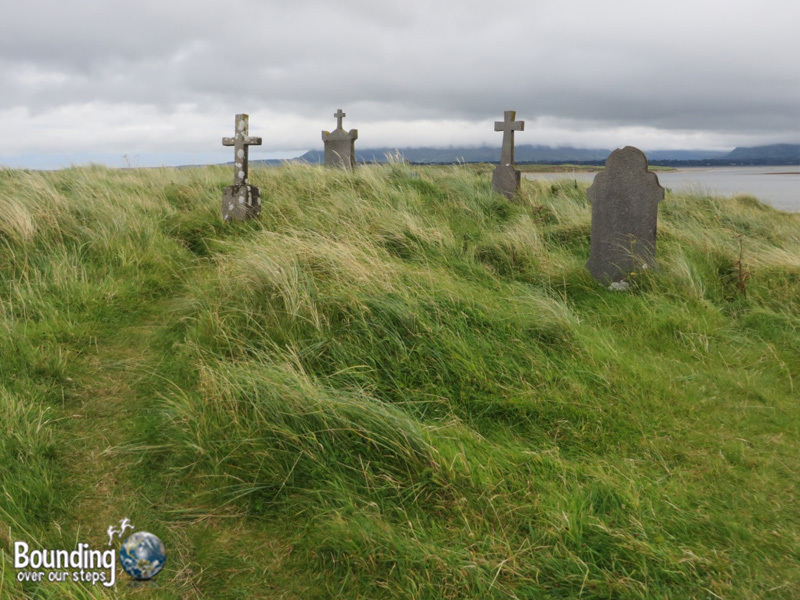 It was fascinating to walk through this graveyard next to the sea. The next section of the hike was along a very calm beach or, like I did, you can choose to walk along the much higher sand dunes. Either way will lead you into a very beautiful patch of forest with the smell of evergreens and a carpet of pine needles. On the other side of the woods was a street where two friendly dogs came to greet me before they headed back into the woods to romp and play. The path leads you back over the runway again only this time at the other end at which point the road bares to the left. When you get to the intersection, make a left and then your first right and walk up the hill all the way to the road. This was the least interesting part of the hike in my opinion. When you get to the main road, make a right and follow it all the way back to Shore Road. If I were to do the hike again, I think I would simply turn back after the woods and retrace my steps as the second half of the hike was rather unappealing and away from the sea. On my last evening in Strandhill, I decided to watch the sunset over the ocean from the seat of one of the sand dunes along the Killaspugbrone Loop and I’m so glad I did. The colors against the shore were amazing! 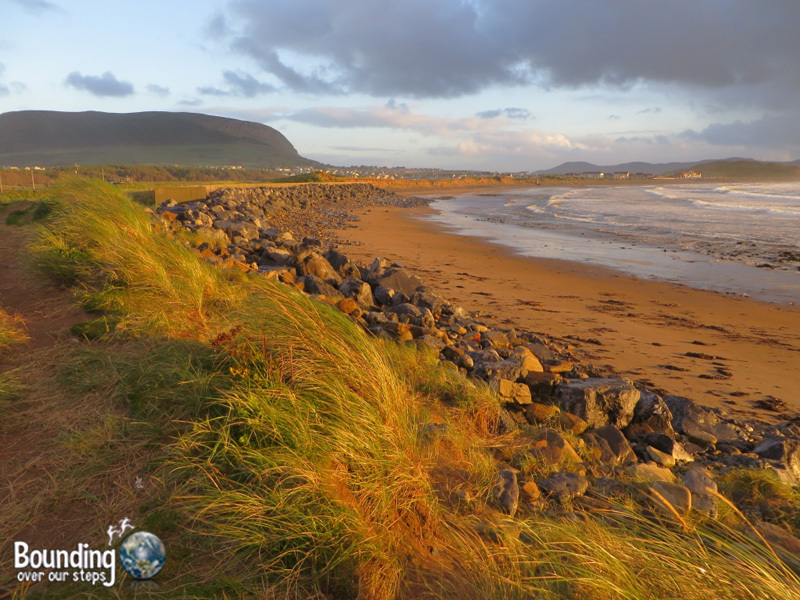 Does Strandhill seem like a place you would enjoy? What activity would you do first?